Use your free Co-op Connections Card at participating businesses on every day items and save! Coweta-Fayette EMC has partnered with over 80 local businesses – restaurants, hair salons, golf clubs, tanning salons, storage facilities, and much more – offering discounts to co-op members. In addition to local businesses, Touchstone Energy®, a national alliance of more than 600 electric cooperatives, has recruited more than 160 national chains such as Choice Hotels, Avis Car Rental, Barnes&Noble.com, Sprint, and many others to offer co-op members national discounts. Your card is good anywhere you see the Co-op Connections Card sticker – whether you are at home or traveling across the country. By using your Co-op Connections Card you will be able to receive 10% to 85% discount on prescription drugs at over 60,000 national and regional pharmacy chain stores—including CVS, Walgreens, Wal-Mart, Target and many more. Learn more about the pharmacy discount program. 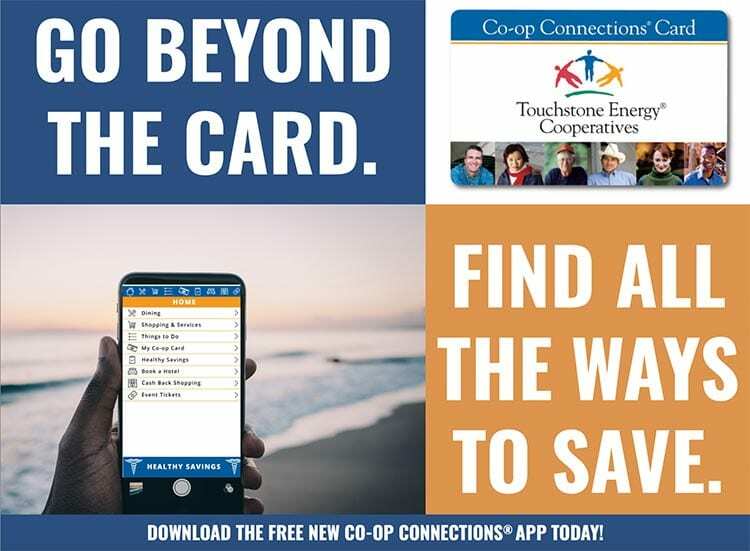 Touchstone Energy® Cooperatives’ Co-op Connections® Program helps you save more and live healthier every day! Our highly successful prescription discount offer is now joined by discounts on dental, vision, hearing, lab work & imaging and chiropractor visits. Best of all, you get all these great benefits for FREE! If you are a local business and would like more information on offering discounts to thousands of potential customers by having your deal listed online and in our Co-op Connections Card and save brochure, click here for more information.